Hey there, fellow Explorers! It’s been a while since our last trip report. Now that I am settled back in Tokyo, it’s time to get this report done. Many of you have told me you’re excited for this one, so let’s get to it! Things have been quite exciting at the TDRExplorer headquarters (which is just my kitchen table in my tiny Tokyo apartment and the random Starbucks every now and again). We recently launched our Patreon (I would be forever grateful if you could pledge, as it helps us continue doing this), began doing more videos on YouTube, and have started posting short and informative tips for your trip on Instagram (my poor attempt at getting you to follow us)! Alright, now on to what you all came here for! This trip sent us to both Shanghai Disneyland and Hong Kong Disneyland in February and March — and we also did non-Disney things in both cities as well. I briefly covered this in our pre-trip report. This time, I am trying something different with this trip report. In addition to reporting on the Disney Parks, I will include portions of the trip where we do things that are outside of Disney. The reason for this is, there is a high chance that during your trip you will be doing other things outside of the Disney Parks and may want some recommendations and ideas. Many of you are coming from overseas, so you want to make the most of your time. But that’s enough for an intro. Let’s get into the first part of our trip, where four friends meet up in Shanghai, China! Afterward, read parts one and two! My friend Lucas and I both live in Tokyo, and our other travel companions are from Australia (Bryson and Troy). 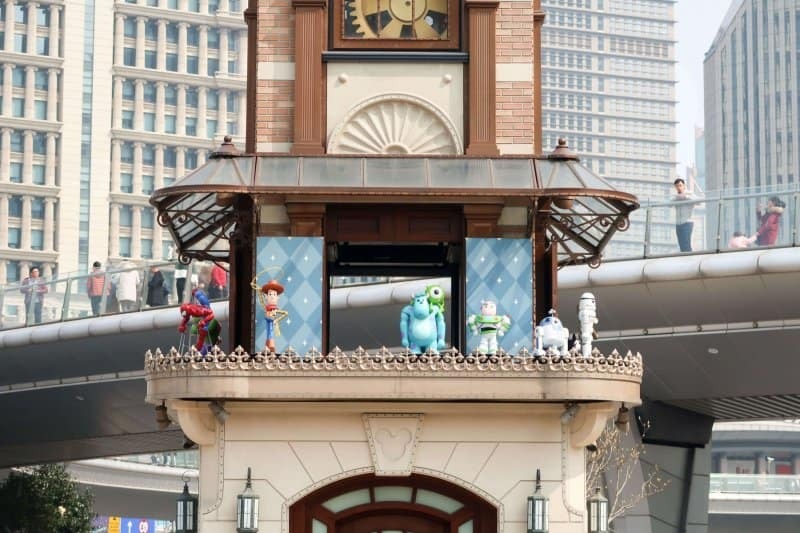 The plan was to meet up in Shanghai at the Toy Story Hotel (where we shared the room to save on costs). As we all know, things never go to plan. Our flight from Tokyo was with Spring Airlines at the unthinkable hour of 02:00, to arrive in Shanghai Pudong International Airport at 04:30. It was my first time with Spring Airlines — they are a budget airline from China — and I wasn’t sure what to expect. Overall, the flight was fine. The seats are nothing special, but the tray tables are sturdy enough you can rest your head on. That is what everyone else was doing, so I followed suit. We had no delays or issues. Since they are budget, nothing is included and you pay for everything. For a 3.5 hour one-way flight for a cost of ¥10,070 (~$87 USD), I can’t complain. I would fly with them again. For most of us, you need a visa for Mainland China before arrival (unless you qualify for the transit visa). 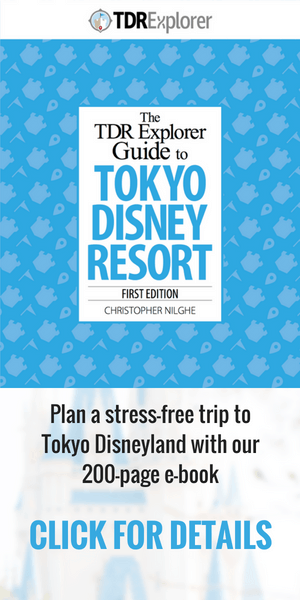 I have covered this in our Shanghai Disneyland Trip Planning Guide, so I won’t go into details about it here. Make sure you read that before you book your trip. For myself and Lucas, we both have a visa that allows us into the country. Mine is good until later this year, while Lucas got the 10-year visa at the Chinese Visa Application Center in Tokyo. 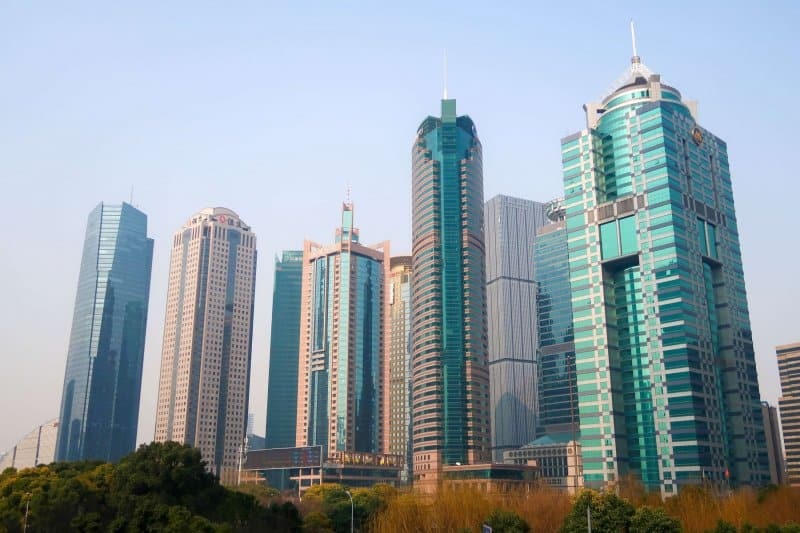 Our Australian friends qualified for the transit visa — going from Sydney to Shanghai, then to Hong Kong — so they didn’t have to get a visa ahead of time. 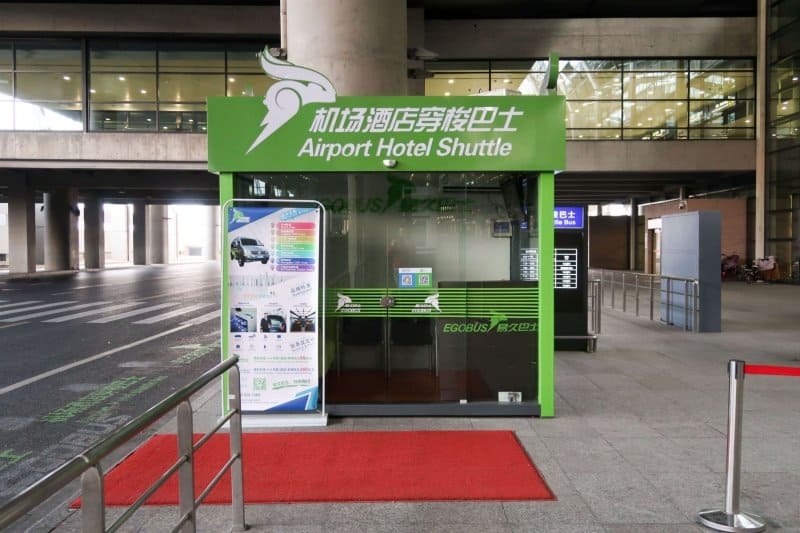 If someone in your group is looking at the transit visa (or applying for a visa in their home country), then everything you book in Mainland China must have your name on it, which includes your flights and hotel reservation. 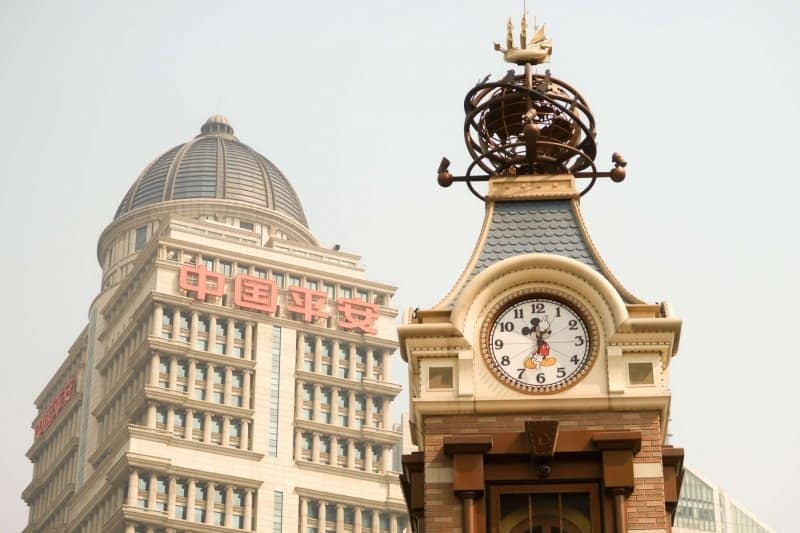 When you book your hotel online at Shanghai Disneyland, you’re only able to put down one name. Immigration needs to see everyone’s name on that list if you’re doing the transit visa or when you’re applying for the visa ahead of time. 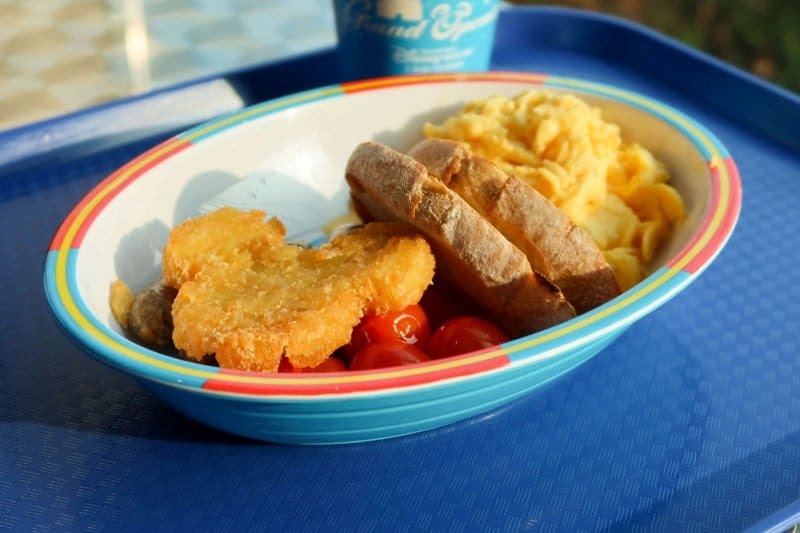 After you make your reservation online, call Shanghai Disney Resort and ask them to put everyone’s name on the reservation and re-send you the confirmation by email (they will only send it to the email associated with the booking). 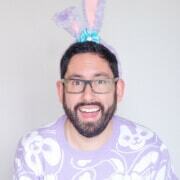 When I phoned, the Cast Member was helpful when I said I needed everyone’s name on the confirmation email. He said, “Ah, you are applying for the Chinese visa, right?” So they know this is a normal occurrence. Use Skype Credits to make the call, if possible. After our arrival to Shanghai, it was time to get ourselves to the Toy Story Hotel. A friend of ours recommended a taxi driver and setting up a pickup time with him (tell him we sent you), which we did, but there was a miscommunication on my part and we ended up missing our pickup window (occasionally, I make mistakes). 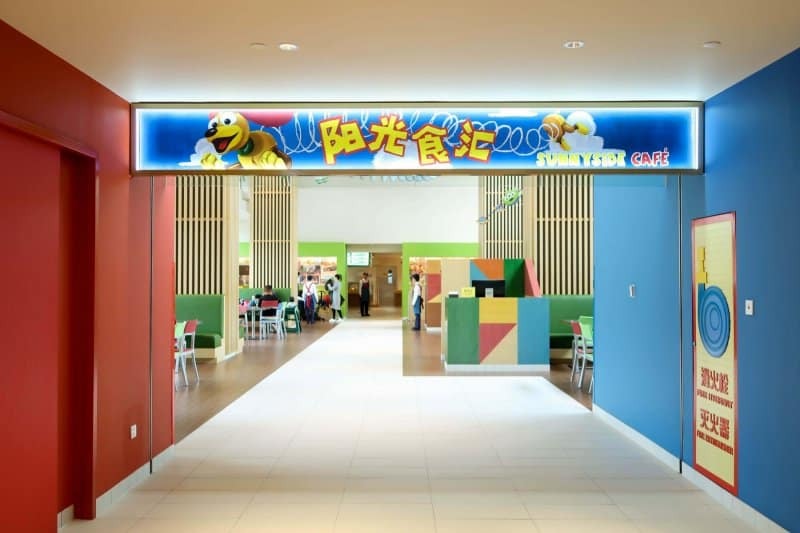 But he was able to pick up our friends when their flight arrived later that night for the cost of about 235 RMB (~$34 USD) for the two of them, dropping them off at the Toy Story Hotel. We took a hotel shuttle for 68 RMB per person (~$10 USD). The counter is on the way to the metro, and you can’t miss it. We told the lady we needed to get to the Toy Story Hotel and she wanted us to give her the address in Mandarin (most drivers don’t speak English). I pulled up the website and showed it to her, and she wrote it down for us. We then made our way down to the taxi area and waited for the shuttle. It took about 30 minutes to get to the hotel. There are a lot of guys who hassle you to go to their taxi; just ignore them and they will leave you alone. We got to the Toy Story Hotel around 07:00 (we took our time at the airport) and did our pre-check in. The room wasn’t ready (we weren’t expecting it to be). The Cast Members informed us to return at 15:00 to get the keys to our room. We dropped our bags off and had breakfast in the Sunnyside Café food court (there’s also the Sunnyside Market for a quick pastry and coffee). The food was all right and featured selections from Western to Chinese. Since it was still early (our friends didn’t arrive until the evening), the plan was to head into the city of Shanghai and check out some of the tourist spots. On my last trip, I only got to stay in the Qube Hotel before spending the rest of my time at Shanghai Disneyland. 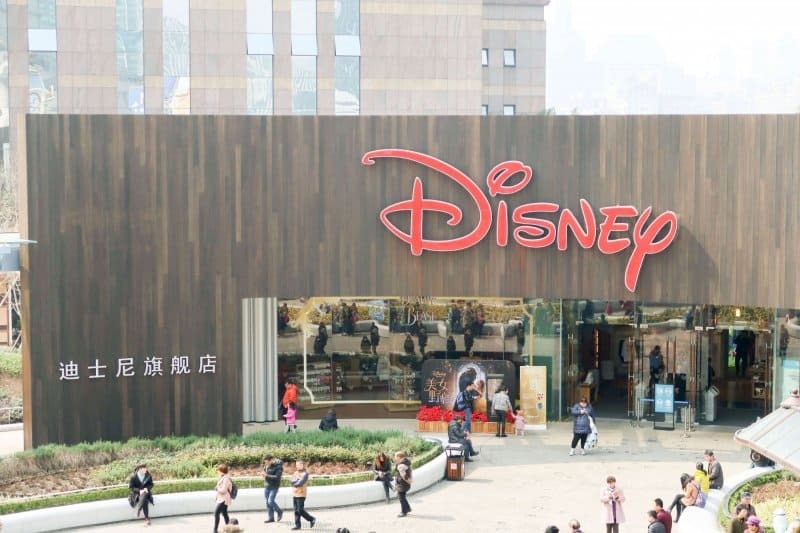 There’s a metro station right at Shanghai Disneyland, which has a few shops and places to get a quick bite to eat. If you’re coming from the Metro, I suggest buying a bottle of water (or small snack) from the Family Mart there as it’s much cheaper than buying in the park. You can refill the bottle of water at the water fountains (which are labeled as safe to drink). 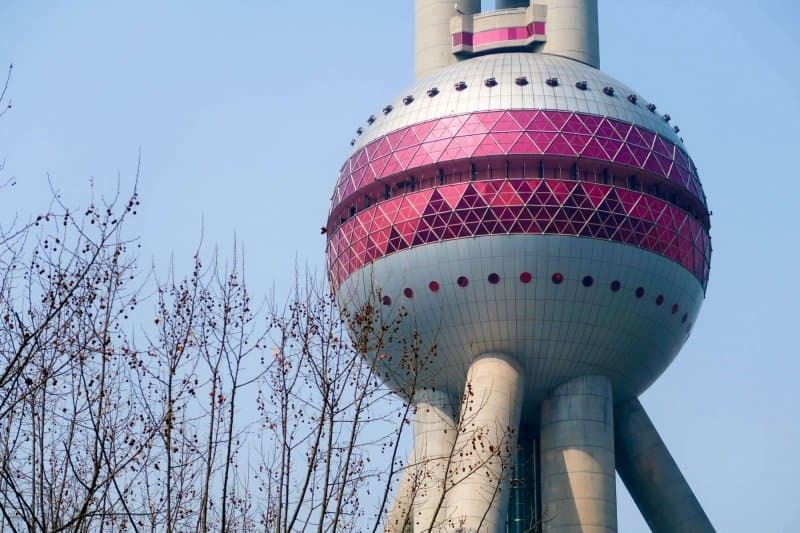 Our only real agenda for the day was to see the Disney Store, Oriental Pearl Tower, and the Shanghai World Financial Center, which thankfully are all in the same area (Lujiazui Station). The only downside is it’s not the quickest to get to from Disneyland. 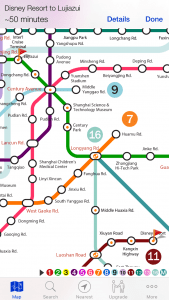 Take Line 11 to Luoshan Road and transfer to Line 16 and head to Longlang Road. Then transfer to Line 2 and head to Lujiazui. This is where all the places I mentioned above are located. 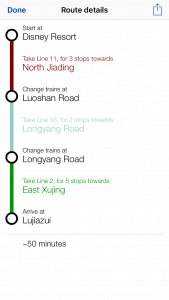 There’s an excellent Shanghai Metro app that we used to figure this all out. If you plan on not having data (our planning guide covers your options) while you are there, take screenshots of the places you’d like to go and save them to your device or print them out (I have photos below if you need them). The large Disney Store is quite beautiful, and I love the clock tower outside. 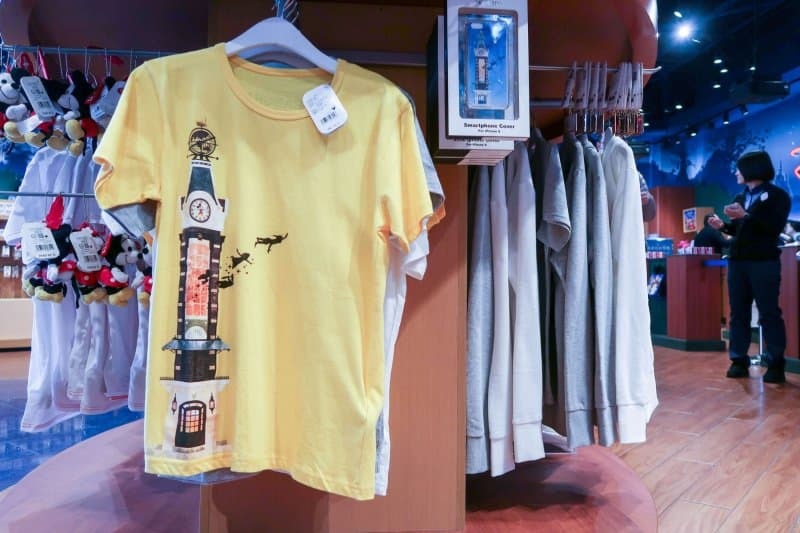 There’s a ton of merchandise and they do carry a variety of exclusive items that say Shanghai on them. 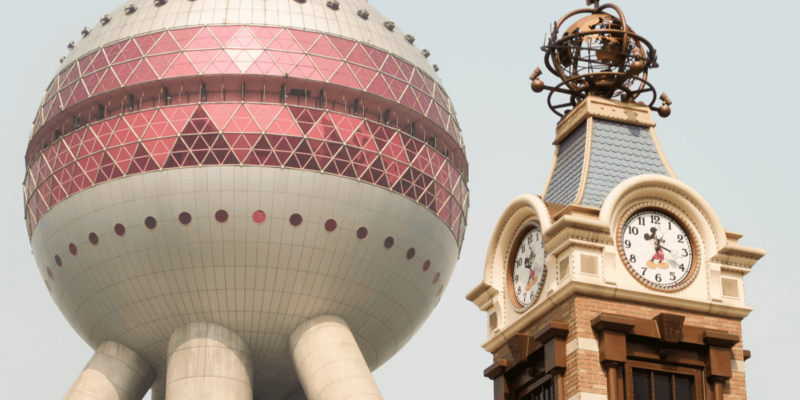 We didn’t bother going up the Oriental Pearl Tower, but we did admire it from afar. In the same area was a Taco Bell (no, we didn’t bother eating there), Dairy Queen, and a number of local places to eat. We did head to one of the malls there and had a look around. I am not into shopping, so it wasn’t anything special for me, but they had a large variety of shops like you would find in any other mall in other parts of the world. Just a bit further down the way is the gigantic Shanghai World Financial Center, which is a skyscraper that has offices, a ground floor shopping mall, conference rooms, an observation deck, and the Park Hyatt Shanghai Hotel (the third-highest hotel in the world). We opted for the observation deck which takes you to the 97th and 100th floor for a cost of 180 RMB (~$26 USD). 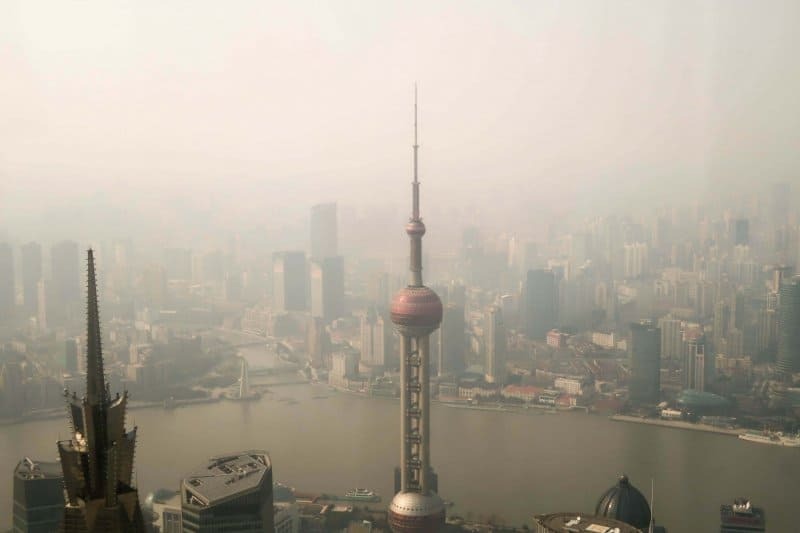 The view from the top is stunning but limited due to smog. We did it mid-day, so my guess is it’s more beautiful in the evening. I would recommend doing this at least once. It wasn’t too busy when we went, even for a Saturday afternoon. The two of us had been awake for close to 24 hours by this point (we didn’t sleep much on the plane), so while it was only 15:00, it felt more like 22:00. 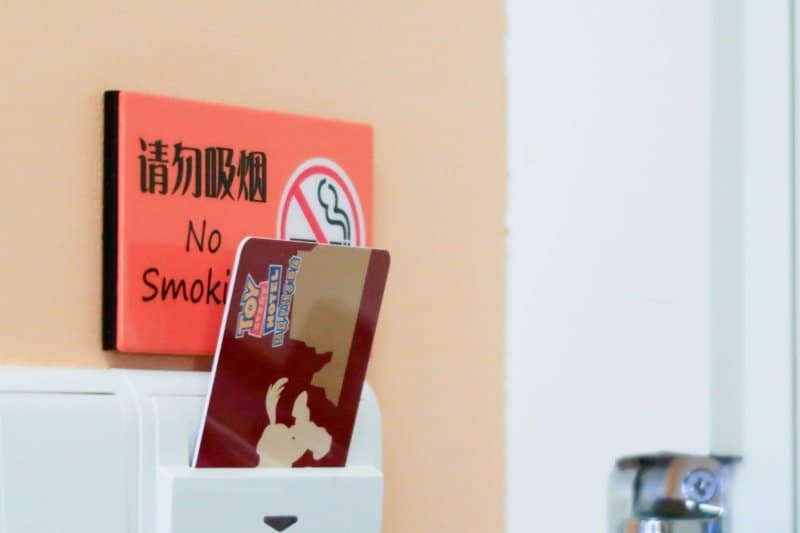 We made our way back to Shanghai Disney Resort and then the Toy Story Hotel and got our hotel room keys. We took a glorious 2-hour nap while we waited for the rest of the crew to arrive. Their flight was delayed over 2 hours, so we had to change our reservation for Aurora that evening. The plan was for 21:00, but the other two wouldn’t arrive until around that time. It was an easy fix: I went to the concierge and asked them to change the reservation. I did check out Disneytown while we waited for our friends and recorded video of merchandise (which I will share once we have it edited together). 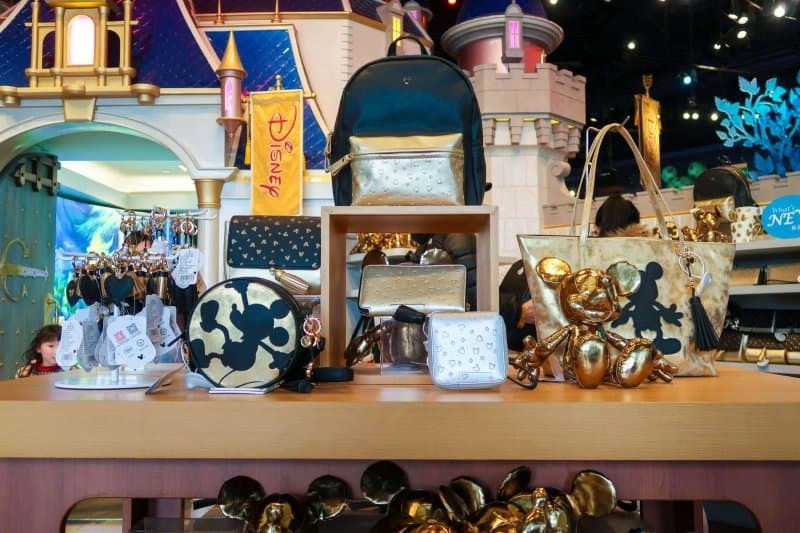 There’s a number of exclusive merchandise and they still have the Grand Opening merchandise. Bryson and Troy made it after their long delay and took the taxi that was arranged ahead of time. Everyone was exhausted and it was time for bed. We had to get our rest for our first full day at Shanghai Disneyland! If you’re planning a trip to Shanghai Disney Resort, read our full trip planning guide and our podcast episodes! Oh my gosh!! Your TR couldn’t be more perfectly timed. We leave in May. I just made our reservations at Toy Story Hotel and saw your suggestion of adding all the names on the reservation for the Transit Visa. Thank you! Thank you! We would have been stuck at the airport. Questions: Did you happen to take pictures of the menus in the Sunnyside Cafe and Market? The Family Mart is in the Disneyland station? Awesome!! Did you happen to notice fresh fruit in the store? Glad to hear that your travel companions made it safe and sound. Looking forward to hearing more about your trip!! We have photos of the menus, which we will be transcribing at some point (not sure when). Most of the food is Chinese style. The item I showed above was one of the few western style dishes. They do have smaller items as well. The Family Mart is inside the station (behind the paid gates). They had a variety of fresh food, I didn’t take note of fruit however, my guess is they probably do have something. I will try and look next time.